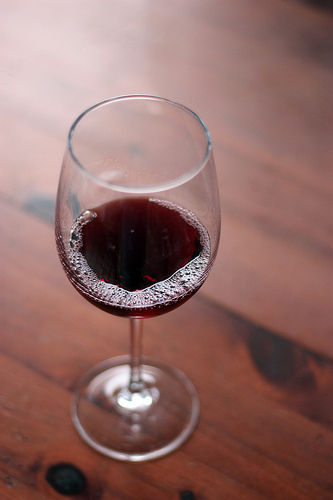 One of the many great things about living in the Willamette Valley is that it’s the heart of wine making in Oregon. There are many fabulous wineries all up and down the valley, with several located just a short drive outside of Eugene. Last Friday I joined my husband and his company on a little tour of two of the wineries, Sweet Cheeks Winery and Silvan Ridge Winery for an afternoon of revelry and wine tasting. 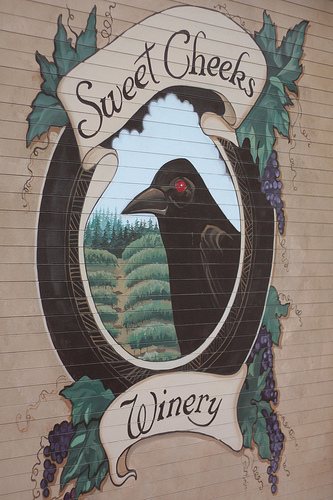 The winery is located in Crow so the logo just seems so perfectly suited to the business. And to making really lovely labels, because let’s face it, if you’re not a wine enthusiast the label might be what makes you choose one wine over another. Silvan Ridge was also lovely, although their logo is a bit less noteworthy. Their wines, on the other hand, are quite delicious. We had tried their Early Muscat–a sweet, semi-sparkling wine–before and loved it, enough that we brought a bottle home with us. We also both enjoyed their Pinot Gris. And this trip also solidified in my mind that I just don’t care for red wines. I like their deep, rich color and they smell good to me but in the end? I just don’t enjoy the way they taste. Maybe I just haven’t found the right one yet. All in all, I think everyone had a great deal of fun and we’re definitely planning to visit some of the other local wineries around here before too much time passes. Ha! More reds for ME! Don’tcha love wine touring??? (how DOES one spell the slang “don’tcha?” anyhow??? Have a great trip!